Boni...the land of wonder. Boni...the land of mystery. Boni...the land of fabulous food. Yes folks, at Boni, you can find anything under the sun. A shoe store? Of course! 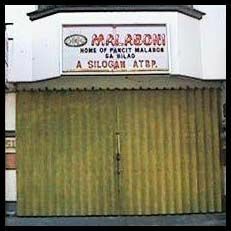 A salon? Yes! Fast food? Certainly! But what about pancit? Ha! Can you find fastastic pancit in Boni? Well, you've heard of Pancit ng taga-Malabon, right? These Malabon people are famous for this type of pancit. But what about Boni? Do they share a similar distinction?